Experience historic Frankfurt at Christmas time and listen to stories about Christmas in the festively decorated historic old town. Christmas is always a special and romantic time in Germany. Try one of our culinary specialties, the Bethmännchen, and warm yourself with a hot cup of mulled wine. Enjoy the wunderful view of the market's beautifully illuminated Christmas tree. 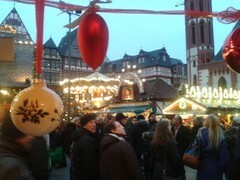 Maximum 25 participants per group, plus 4,50 Euro per person for one hot cup of mulled wine and a Bethmännchen tasting. Please note the a booking of this tour is only possible until 3 p.m.